The 6M50 07:55 Westbury to Bescot engineers train sometimes runs with no load for all or part of its journey. 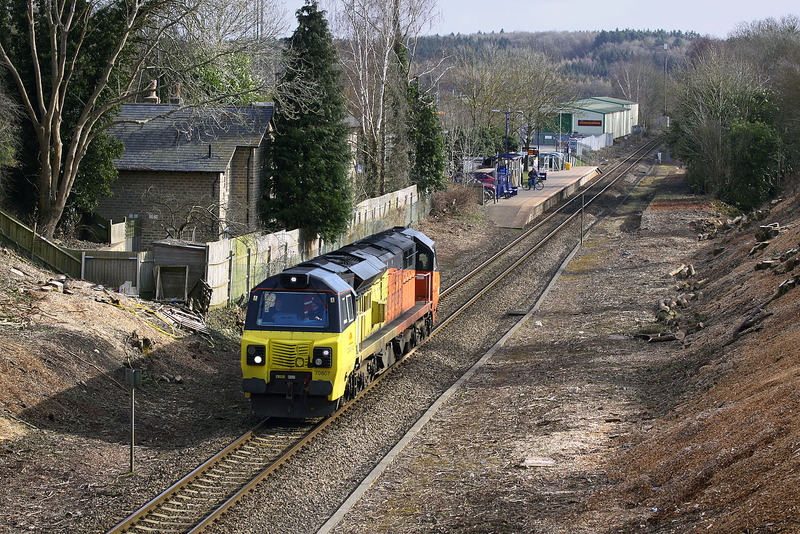 This was the case on 24 February 2015, when 70807 was pictured having just passed through Hanborough station, running as 0M50. I wouldn't normally bother taking a light engine move, but as this is off its usual route due to the Harbury landslip, it has added interest. Also, the fact that there is nothing behind the loco gives a clear view of the station, with its abandoned down platform now clearly visible after recent tree clearance. In the background is the Oxford Bus Museum. A solitary passenger waits for the 1P47 12:06 Worcester Foregate Street to Paddington Class 180 unit.